Home Latest Roofing News & Offers How do you calculate the roof area for a project? How do you calculate the roof area for a project? When undertaking work on a roof, accurate measurements are important. Roof projects may include tiling, installing insulation, ventilation and installing guttering. To calculate the roof area of a property with a classic gable roof (on which two roof sections meet in the middle in an inverted ‘V’ shape), all you need are two key dimensions. Firstly, you will need the measurement for the length of your roof. This is the length of the wall of your property on which the bottom of the roof sits. Next, you will need the roof slope height. 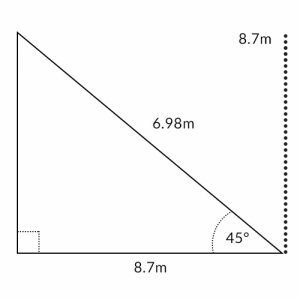 This measurement is different to the height of the roof, which is taken at the apex where both sides meet. To calculate the roof area of one side, simply multiply the length of your roof by the roof slope height. If you have these dimensions, the pitch of the roof won’t matter. Most owners will have access to this information from building plans obtained upon purchase of the property. However, if access isn’t available to these plans, the local council should be able to provide this. Take this example of a perfectly square house with 76m² floor space, a 45° pitched roof and a 2.35m roof height. The roof slope height is 6.98m. Please note: if you are working out how many roof tiles you need, this calculation assumes there is no chimney or other section of the roof not covered by tiles. The length of the roof is 8.7m for this square house, as 8.7m x 8.7m is 76m² (total floor space). The roof slope height is 6.98m. So, for our example the half roof area is as follows: 8.7m x 6.98m = 60.73m². Because this is only one half of the roof, we will need to double this number to find the entire roof area (121.45m²). 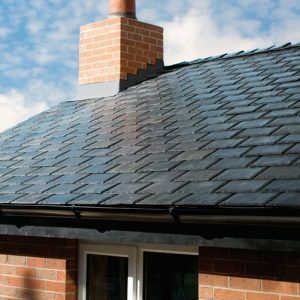 With the above information, it is possible to work out how much insulation you may need, how many roof vents you’ll need to install, and how many roof tiles to purchase. If you’re unsure on any of the above or your roof is not the classic ‘gable’ roof, please consult a professional installer so that you can make informed decisions. Alternatively, contact our helpline on 01752 692 760 and we will be able to help you with your calculation.